Son of Old One Horn: The Sequel! There is nothing better than Southern fried chicken Sunday afternoon after church, except maybe chicken fried steak. No one could fry up chicken better than Auntie either. She sang gospel songs while she fried up the chicken. We all thought God blessed the chicken because of Auntie’s singing. Golden, crispy, and hot. Fried to perfection and stacked succulently on a big platter in the center of the table. Surrounded by mashed potatoes in a big old bowl, beside which sat another bowl of white gravy, a platter of real biscuits! Not the frozen kind we get from Wal-Mart today. Some real hand-churned butter, and the South Texas version of a tossed salad with iceberg lettuce, green peas, little yellow cubes of chedder cheese, and Miracle Whip for dressing. And the tea. Sun tea morphed into “sweettea,” said quickly all in one syllable. Auntie put Lipton tea bags in a gallon jar filled with cistern water. Sat the jar on the back porch and let the sun shine on it until the water turned a golden brown. This could take nearly all day. But, boy! Made with rain water. Mixed with lots of white sugar it became sweettea, a heavenly drink fit for sweltering South Texas afternoons. 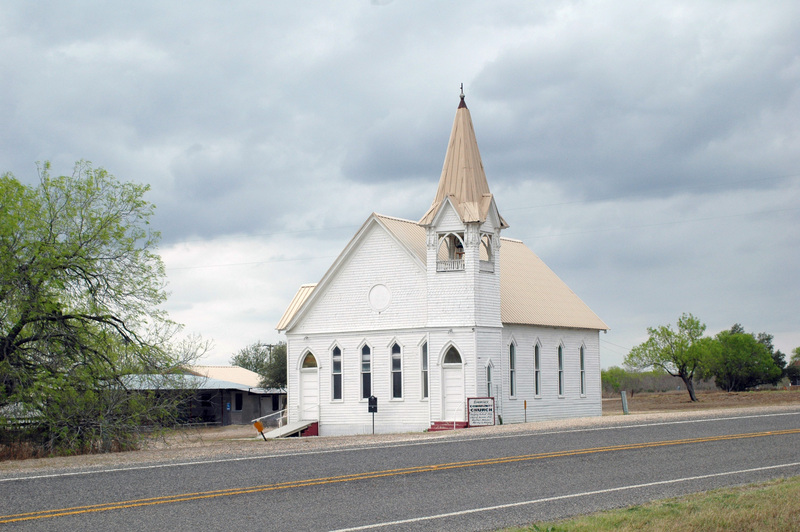 The circuit preacher came home with Uncle, who deaconed the all denominational church in Simmons, Texas. It was the custom. Everybody knew it, for the preacher loved Auntie’s fried chicken and all that country cooking that went with it. And her impromptu gospel singing in her high nasal voice. He looked forward to dinner at Uncle’s when he came to preach in the little white community church. Because Uncle’s family was so big, we sat at two tables – one for the adults and adult children and the other for the rest of us younger ones. David sat at our table. He didn’t like it. He didn’t like sitting with “children,” he said. He belonged with older folks on such occasions. Sweet little Liz always understood. But the rest of us boys, and Uncle had plenty, were not quite so sympathetic. Of course, our snide comments were usually repaid with a thumb on the head or a well placed frog in the fleshy part of the bicep when we were least expecting it. Then there were the well timed and nefarious epithets David delivered with squinted eyes that made us laugh, but stuck forever like a tick on a dog’s back. Of course, it wasn’t anything I said this time, it was what I did that got me tagged with a new moniker by David’s flagitious wit. After the preacher “God blessed” the chicken and praised Auntie’s kitchen with all its savory, smacking good country cooking aromas, we sat and hands flew into the platter of fried chicken. Between David and I remained the last piece of fried chicken in the platter. We’d each consumed several pieces already and were eye-balling that last piece. About the time David finished up the thigh he’d been working on, I had finished a drumstick. We reach simultaneously and I came up with the prized last piece while David glowered at me. “Got’da be faster,” I quipped, fully satisfied at having beat my older cousin to the draw.I bit into the chicken with more gusto than usual. David continued to glower. Into my last bite, the epithet formed on David’s lips, fell preponderously upon the table, bounced around among the dishes, and ricocheted off walls into the ears of all gathered around the table. Then an explosion of laughter! And much to David’s chagrin, I did try to live up to that epithet. It was the least I could do for the old bull that ruled the pasture across the creek in Uncle’s back forty.